Robinson, who died at age 53 in 1972, would have turned 100 on Jan. 31. His No. 42 was worn by every major leaguer Monday. The number was retired around the league in 1997. Colorado Rockies manager Bud Black recalled reading about Robinson as a youngster. "To this day I still read about him," Black said in San Diego. "What a pioneer. 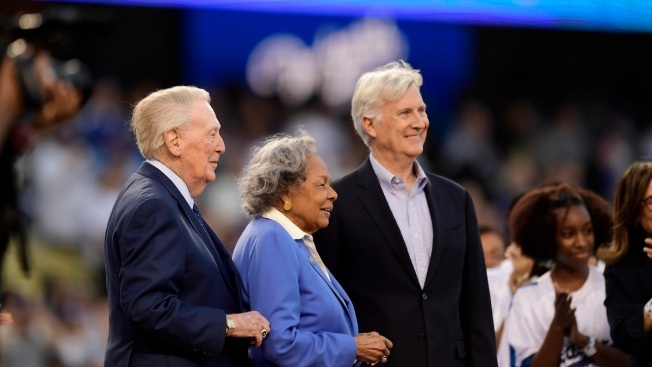 What a great example of a human being and what he meant to our country, and in the bigger picture, what he meant for all of us culturally, not only in baseball, but in society." Robinson's No. 42 was cut into the center field grass. The Robinson siblings each tossed out first pitches. David's was a strike to Roberts, while Sharon's bounced on its way to catcher Russell Martin. Sharon Robinson works as MLB's education programming consultant. Dodgers closer Kenley Jansen and former Dodger Matt Kemp, now with the Reds, came out to home plate to pose with Scully and the Robinson family before the game. Missing from this year's LA ceremonies was Don Newcombe, the third black pitcher in the major leagues when he was with the Brooklyn and later Los Angeles Dodgers. He and Robinson were among the first four black players named to an All-Star team. Newcombe died in February at age 92. Chicago White Sox shortstop Tim Anderson hosted more than 75 kids for a screening of the Robinson biopic "42."